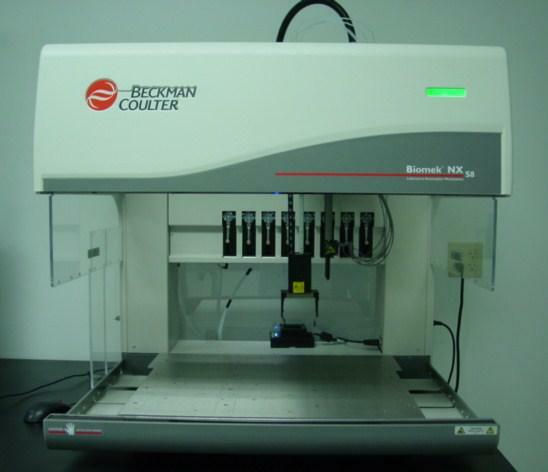 The Biomek® NX is a compact (64 x 61cm) liquid handling workstation. Using interchangeable locators (ALP’s), the NX deck can be configured for a wide variety of applications. When configured with an 8 channel (Span 8) pipettor, the Biomek NX is ideal for accessing sample tubes or microtiter plates for sample reformatting or hit picking. Also available are 96 or 384 channel heads which enable whole/partial plate processing for replications, reformatting or other higher throughput applications. Numerous NX’s can be found in a wide variety of research applications including a wide variety of molecular biology applications (nucleic acid purification, pcr setup, next gen sequencing library prep). NX can be configured as a stand alone workstation or integrated into a larger automation system using either Beckman’s powerful SAMI software or other off-the-shelf scheduling/integration software such as Thermo Fisher’s Momentum, PAA’s Overlord 3, Brooks Automation’s Sprint 6 or Retisoft’s Nexus or Genera. Hardware options available; 96 channel head, 384 channel head, 360 degree rotating gripper, bar code reader, shaking peltier ALP, 96 well flat or post magnetic locator, tube racks, plate locator ALPs (many), disposable tip loader ALP, passive and active wash ALPS, bar code reader…many more.